That which visual artworks lack, inasmuch as they have not managed the format jump from canvas to mass society, is the Olympic simultaneity that effortlessly flows to the “product”. The “product” is the classic competitor of “art”. These two unequal siblings (one pale and falling prey to consumption, the other a go-getter with a fresh MBA under his arm) are squabbling over control of the old family business “bourgeois society”. Their strategy thereby: to get hold of attention resources. In a five-minute en passant act, monochrom member Daniel Fabry stamped a sheet of paper full with “Sun Breasts Hammer” logos, put the paper in an envelope and sent it to the PR representative of the “Coke Light Art Edition”. Fearing that this might not be enough, he jotted down the name “Kippenberger“ as well. 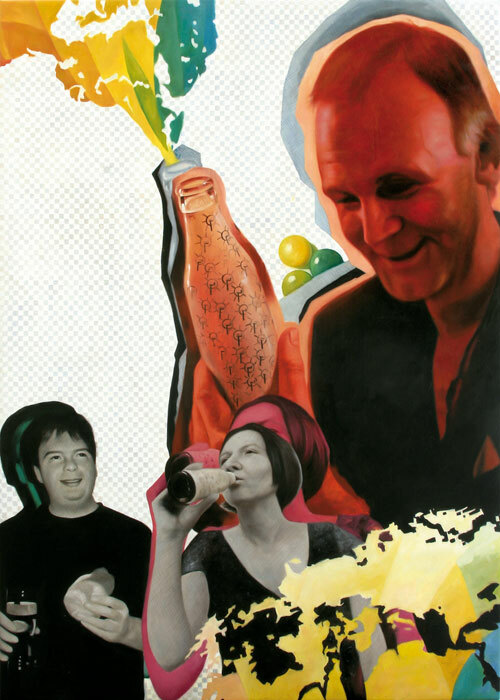 Thus the jury was left with no choice: after all, Martin Kippenberger is one of the most famous... The motif would have to be to be printed onto 50,000 bottles of Coca Cola Light for exclusive distribution in the art world, and the first 5,000 euros flowed into the bank account of an enterprise no longer quite so ailing. The catering consisted exclusively of dishes cooked using Coca Cola. People can come up with the most wonderful ideas when faced with a deadline. Several days later, an old monochrom acquaintance, who was sitting out his socially precarious existence in a Viennese advertising agency, sent an email to the helpdesk of the mother company in Atlanta. I was baffled and shocked, when I saw that in Austria, Europe Coca Cola awarded a group of so called artists with a price for the design of a coca cola bottle. Especially when I saw that the design includes a hammer, a sun and a pair of breasts!!! These artists are well-known chaotics and leftist noisemongers, and now they have managed to use the family-oriented and friendly image of the Coca Cola bottle for their own evil ways. How can Coca Cola allow icons of communism (hammer! ), nazi ideology (sun!) and sexism (breasts!) to be put on their bottles? Moreover, the price included a large amount of money!! A few weeks later he received an answer from the Viennese PR agency that had dreamed up the whole nonsense (accompanied by the rebuke of his boss, since agency executives are in constant contact with other agency executives via a Rube Goldberg system of secret passageways). In the interest of orderly relations I would like to respond to your complaint regarding the “Coke Light Art Edition”, which reached me via a detour through Atlanta. The only explanation I can find for your negative reaction is that you probably were too little informed of the project’s background and thus have fundamentally misinterpreted the effort. The “Coke Light Art Edition” is a very challenging art project with a target group having a great affinity for art. I heartily invite you to obtain more information at www.cokelight.at. The work that you have criticized “No one helps nobody” and the use of the “Logo of the Lord Jim Lodge” were selected as one of the 3 winning projects by a prestigious jury headed by Rector Stephan Schmidt-Wulffen (Academy of Fine Arts Vienna). You can read the jury’s comments regarding this selection on our website. At www.wikipedia.org you will also find further information on the Lord Jim Lodge, its logo and the artists who originally stood behind the organization, and also on the artist collective monochrom, which acquired all rights pertaining thereto in December 2005. Of course you are entitled to maintain your critical position, but we also ask that you respect the sound judgement of prestigious and independent art experts, whose integrity stands beyond question. Furthermore, openly expressed criticism should at least be well researched and factually informed.